Try a Chicken Curry Recipe from a curry guru. If your favourite Chicken Curry Recipe needs a bit of a change then try convincing a curry guru to share their secret ingredients with you and teach you how to make an authentic, Indian chicken curry. They are known to guard their curry recipes with their life and I have to admit that this slighlty strange behaviour is enough to get me to sample the fiery offering even though I don't really like spicy food. "Bring out your gourmet chef with these delicious curry recipes." Curry is now an international dish recognised all over the world and come in many gourmet variations of soups and stews but essentailly contain the same basic mix of spices. Although many legends abound on the origins of this classic Indian dish, most people accept that it comes from the word "kari" meaning spiced sauce. Believe it or not curry has surpassed fish 'n chips in Britain as the most popular meal. How Hot Is Your Curry Powder Mix? Some like it hot and they are quite particular about their curry powder mix. I don't claim to be a curry expert but I do know that the freshness of the spices is fundamental for the best results. 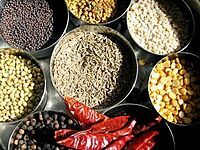 Curry powderis a general term for a mixture of spices that can make a curry.A genuine Indian curry would require these basic ingredients, Cumin, Coriander seeds, tumeric and chilli powder for heat. Other optional extra spices to add are ginger, black pepper, mace, bay, green and black cardamon. For the best and freshest results keep whole spices and grind as you need them. Each spice has it's own way of releasing the flavour and heat so it is important to know your spices and how to get the sequence right. 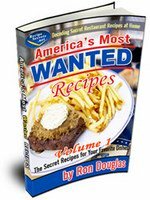 I twisted a few arms and pulled in a few favours from the experts for these "Top Secret Gourmet Recipes". Some Curry Recipes are quick and easy while others will require more nurturing. Mostof the curries do not require culinary expertise or cooking school certificates to make.